Ok, so you’re ready to go out fishing. You have your rod, but where are you going to keep all the tackle? Your lines, lures and tools? That’s where a tackle box comes in handy. Tackle boxes come in different forms and sizes. Which one you choose depends on the type of fish you’re catching, where you are fishing, and the means by which you intend to spend the trip. We’re going to go through some of the basics of fishing storage, and hopefully make it easy for you to choose the best tackle box for your day of fishing. Tackle boxes are used to store all the bits and pieces you need for a day out fishing. Some equipment is considered essential, no matter what level of fishing you are at, where you are fishing, or the kind of fish you want to catch. And then there are the nice-to-have’s like portable scales, hook removers, a fishing guide, fillet knife, leaders, a camera, phone, fire starters (lighter, flint etc), stringer. Now you may not want to keep all of these in your tackle box, but you’ll maybe want to bring them anyway, depending on your goals for the trip. From a high level, the two main types of tackle boxes are either hard or soft. When most people think of a tackle box, they think of the hard type, which is a box. The soft type are actually backpacks, which are carried over the shoulder like any other backpack. You can also choose from bags, which are in the shape of a box, but made from soft, padded material. Tackle boxes are robust, particularly if they are made well. Just make sure any hinges or handles are strong and sturdy. The vast majority are made from hardened plastic. Why plastic? Well, plastic tends to be lighter and isn’t susceptible to damage from too much exposure to water. Now don’t think that all plastic boxes are waterproof, they’re not (although water won’t damage the plastic itself, of course). Be sure to check that whatever box you’re intending to buy, is actually waterproof (I.E. it won’t leak in water) if you want the inside contents to remain dry and you know the box will be in contact with water (or accidentally will be! – if you’re out on a fishing kayak, your box may get wet, even if you thought it wouldn’t). It is possible to buy metal boxes, which are a little ‘old skool’ now. They can get damaged quite easily with dents, especially if it’s not well made, and they absorb heat more than plastic. So, if you’re out on a hot sunny day, the contents are going to get pretty toasty! Are there any downsides to taking the hard box option? Well, it takes up one of your hands when you’re moving around. You can end up more limited with what else you can carry with the one spare arm. Tackle boxes are great for the necessities, but if you want to carry lots of extras, they aren’t so good. Cameras, rod holders, and extra clothing for example. A box isn’t going to be as useful and dynamic as a backpack. Of course, this isn’t as important if you live by the water or you drive your car to your favorite fishing location. But if you need to walk any distance, bear these negatives in mind. The two main types are ‘Tray’ and ‘Drawer’ style, although you can get variations of both. These are the most common type. Trays, storing all different sizes of your smaller kit, lift in and out of the box for easy access. The drawer type boxes have sliding drawers for access to your essentials. They often vary in size so you can store items according to size and type in different slots. A lot of boxes are hybrids of the two we have mentioned. For example, you can buy boxes which fold out to display multiple levels of trays or drawers and trays. These are often referred to as racked tackle boxes. The soft box option is normally made from nylon. Because you are hands-free, you can easily navigate obstacles en route to your fishing spot. One of the big advantages of a soft bag is the amount of gear you can carry around. They generally take more than the hard option. You can bring flashlights, knives, cameras, water bottles, your fishing license and much more. They can even be used to carry portable rods (poles that come in separate pieces). Another benefit is weight. Soft bags and backpacks are usually lighter. Be warned though, if you carry too much stuff, it can get heavy, so try not to bring everything you have. Try to think about the essentials that you need and the "nice-to-have’s", but try not to carry around stuff that you know you aren’t going to use on a trip. Otherwise you are adding extra weight for no reason. You can always keep small hard tackle storage within the backpack or bag. Things like bait/lures, hooks, line and other bits and pieces. Use small plastic compartmental boxes to keep everything where it needs to be, so you can easily grab anything you want as and when you are fishing. These boxes should comfortably fit into a backpack, where you can then store other tackle and accessories that you need for a successful day on the water. Here are some tackle boxes for you to consider. We have added a variety of different types for balance. Happy fishing! 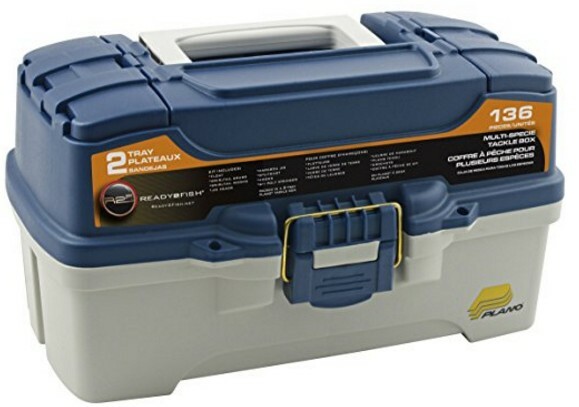 Dimensions: 14.2" x 8.2" x 9.2"
With its Dri-Loc O-ring seal, and three latches to keep the lid firmly fastened, this is a great storage box for those who want to keep their stuff bone dry. If you’re a kayak fisherman, this may be a good choice for you. It comes with 4 fixed horizontal compartments. There are additional dividers included so you can build up as many compartments as you want (up to 23). If you just need a small and very portable box, then check out the StowAway boxes from Plano. This one in particular is the medium sized box, (but still small). Create between 12 and 18 compartments to keep your hooks, lure and bait. The box is clear so you can see where your gear is without opening the lid (the lid latches securely). Away from fishing…some customers end up using these to store small tools, like drill bits, screws and nails. And here we have the cost-effective option, for those wanting to go hard plastic. This one is probably best suited for casual fishing or those just getting into the hobby who want to get up and running quickly. It ships with some hooks, jig heads, floats and weights. Features two trays that comprises of 132 pieces of assorted tackle. Note that the trays are hinged to the box, but there are dividers included so you can shape the compartments to the size of your liking. Also comes with a handy fishing guide. The Wild River 3606 is a great multi-purpose storage backpack, with the option to purchase with or without trays. There are multiple zipped and meshed pockets on the outside, which are ideal for taking tools and gadgets that you need to get your hands on in a hurry. The main storage area (inside), is roomy enough to store up to 6 tackle containers. There’s also a large front pocket, where you can store an additional 4 boxes (we’re talking the Wild River 3600 & 3500 boxes here). It has adjustable shoulder straps and the bottom is protected with base pads to combat wear and tear. This tough polyester water-resistant bag offering from Spiderwire is the first soft bag on our list. It has a durable molded bottom, suitable for all conditions. Inside, it includes four plastic storage containers for all your lures. There are a few other useful features too. It has large pockets on the outside (located on the front and side), with zippers, for placing valuables such as phones or small cameras or other bits and pieces. There are pockets inside too. And there’s the holders for pliers. Can be carried around with its adjustable padded strap or with the fixed handle. This bag contains 10 equally sized compartments. There is a convenient padded strap (which adjusts) so you can carry over the shoulder. Comes with extra pockets. Ok, over to you... do you own a tackle box? Do you have any of the ones on our list? Can you recommend other boxes?